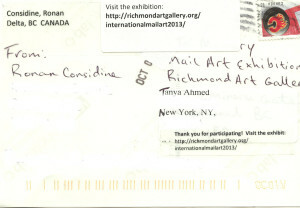 Last year I sent off a postcard of one of my images to the mail art call by Richmond Art Gallery on the theme of memory. You may recall I sent the photograph of the blue room with the red rectangle. After the postcards had been displayed they were then sent out to other participants in a giant swap. This week I received my swap. It was a postcard from a photographer called Ronan Considine. Ronan, was born in Dublin, moved to Canada as a child and currently lives in Vancouver, British Columbia where he works as a travel and landscape photographer. The first thing that I thought when I received Ronan’s postcard was that the blue colour palette matched the photographs I posted last week. My post about cyanotypes and Teddy’s curlers. It seemed like destiny for me to receive Ronan’s postcard! The second thing was that I wasn’t sure if it was a photograph or a painting, the colours were so delicate and pastel. I hadn’t seen anything like that before and really had to study it. Remarkable! 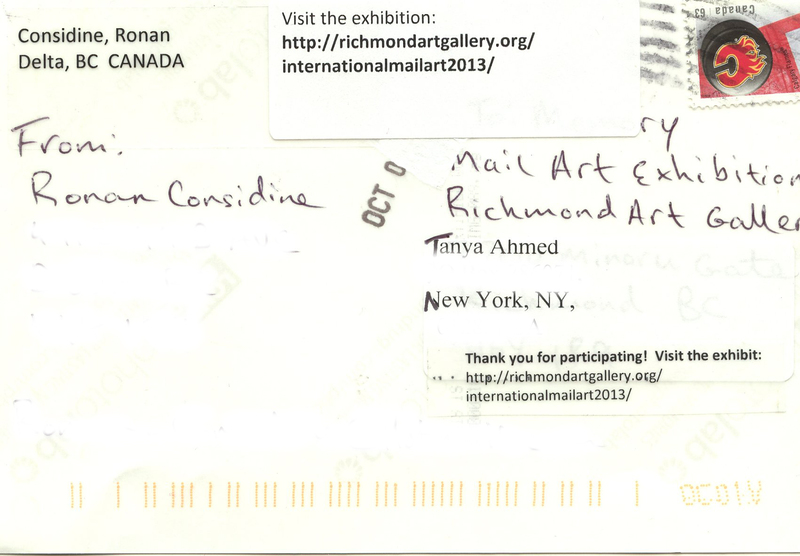 The back of the postcard was interesting too, having been in the mail twice, so I include both sides of the postcard below (street addresses removed). Photograph copyright of Ronan Considine, used with permission. Thinking about Ronan’s image brought to mind one from the archive- a view over Afghanistan. Ronan’s mountains have a softness that disguises the formidable landscape and presents a beautiful vista. The lovely light, slightly surreal with its pale pink and blue hues, is what transforms his image. My photograph over Afghanistan is bare and much less romantic. 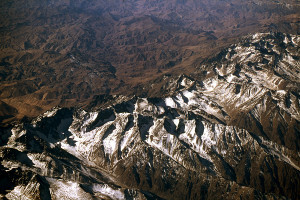 The sunlight catches the near peaks and the sprinkling of snow brightens, but fundamentally doesn’t alter, the impression of monotonous brown rock. The terrain is rough and endless. 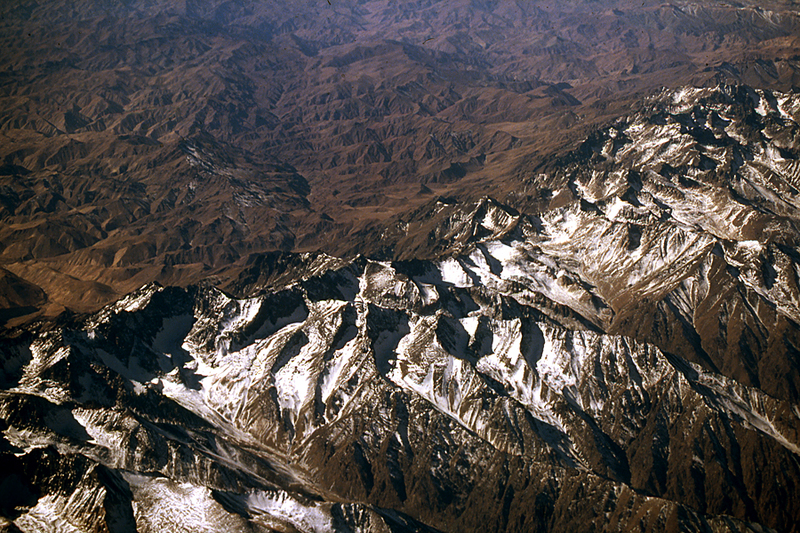 I know people live and travel over this mountainous region of Afghanistan. Maybe they travel over the peaks in Ronan’s image too. One image though reminds me of subsistence living and the other of feted explorers. 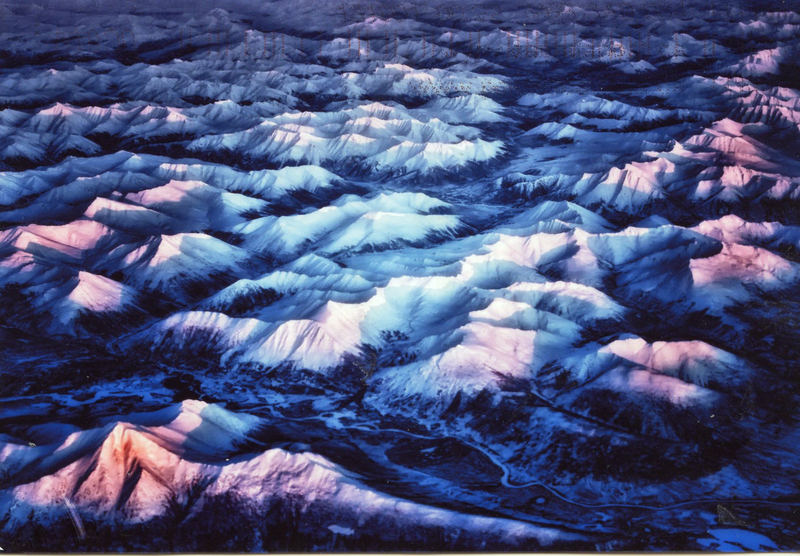 I wonder how my photograph would have looked if I’d flown over at sunset? All this talk of mountains also made me think about the Sinjar Mountain range in Iraq and the Yazidi refugees, no snow there, temperatures in the 90s, not romantic and not subsistence either, just desperate. Ronan’s image certainly is a beautiful one with that surreal light. Odd though that I then connected with Richard Mosse and his images of war zone landscapes in infrared. Catherine, I can see that connection too now that you have mentioned it. Thanks.